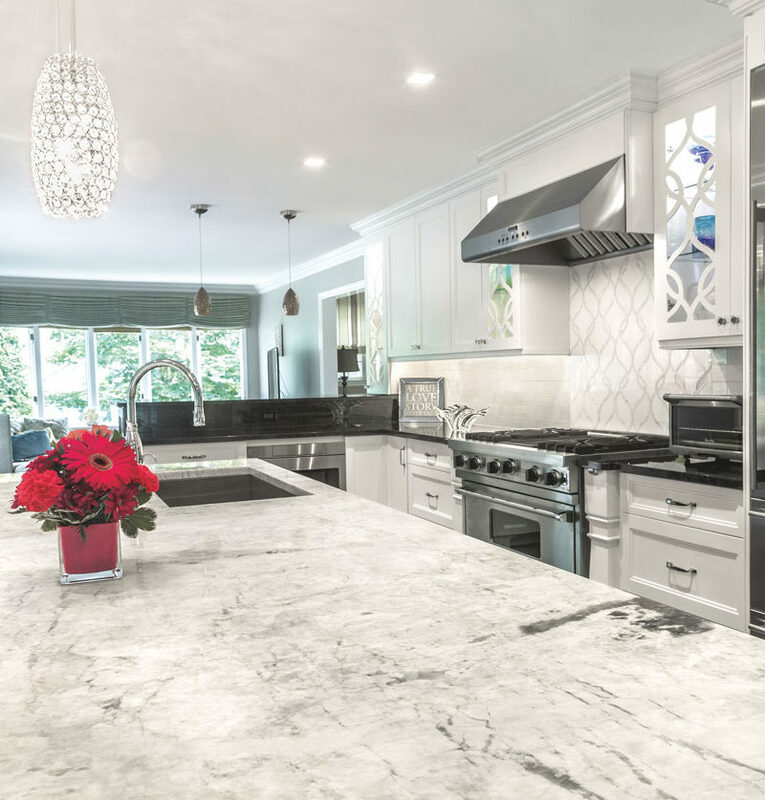 White Macaubas can appeal to homeowners who want a marble look without that softer stone’s need for coddling. Courtesy of Aria Stone Gallery. Tan and taupe dominate in this Ice Flakes quartzite, which has areas of translucence. Courtesy of MS International. Like granite, quartzite can have eye-catching movement, as shown here by Fantasy Macaubas. Courtesy of Marblex Design International. Quartzite, a natural stone, promises luminous, lasting countertops without pampering. The Carefree House examines aesthetically pleasing, low-maintenance and durable home products. 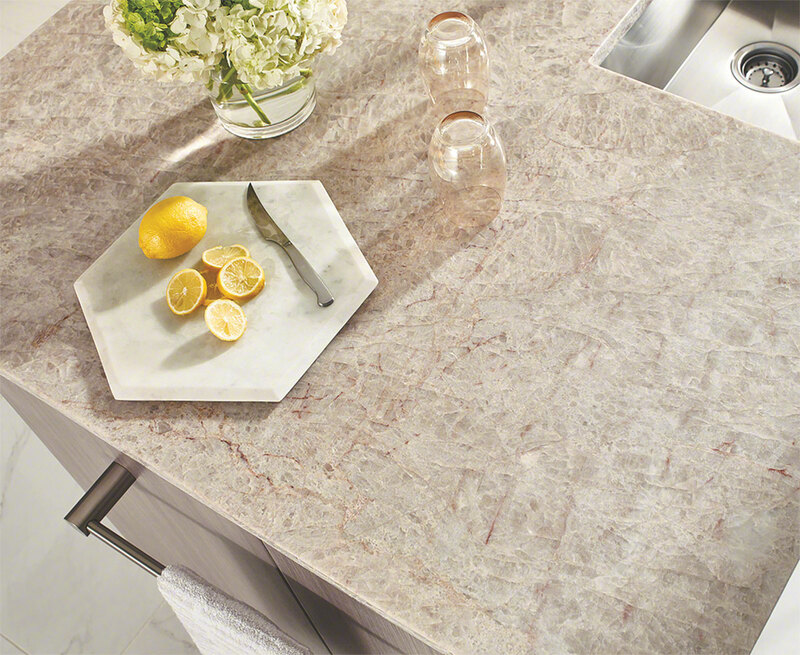 This issue’s topic is quartzite countertops. 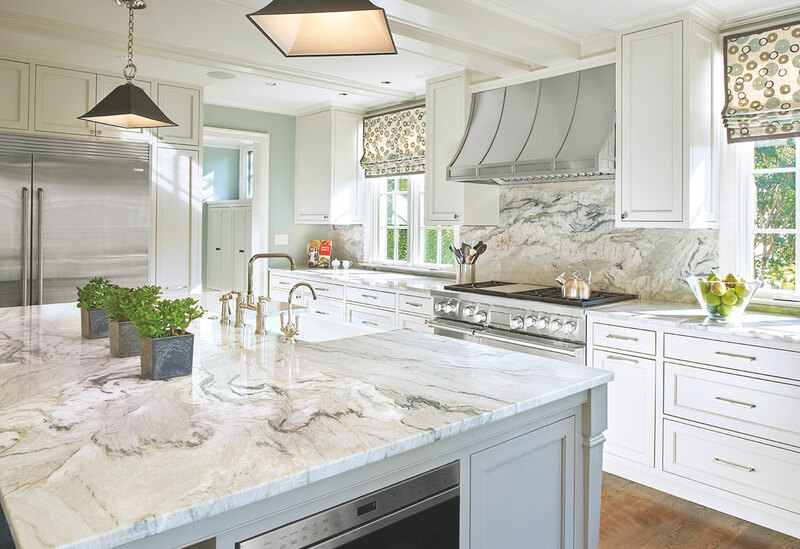 DESIGN NJ: What is quartzite? How does it differ from granite, marble and manufactured quartz? KAREN KIRK: Quartzite is a natural stone despite having a name similar to manufactured quartz. It’s its own category of rock. It’s not granite. Quartzite starts out as sand and goes through pressure and heating while buried inside the Earth’s crust. It’s quarried for use in homes. It’s not an uncommon stone. DNJ: How do the slab sizes for quartzite, granite and marble compare? Is fabrication similar? KIRK: The sizes vary but are comparable to granite and marble slabs. The harder the quartzite is, the harder it is to fabricate. Taj Mahal is a very hard quartzite, and when cutting it, the tools will dull; you have to go very slowly. DNJ: Online research reveals that salespeople aren’t always knowledgeable about quartzite. How can consumers be sure they’re not buying a less-rugged stone? Can its pedigree be judged by appearance alone? KIRK: There’s no way to tell just by looking, but it’s one of those rare cases where anyone can figure it out with simple testing. Bring a glass tile or wine bottle or glass mayonnaise jar to the stone yard and ask for a sample of the natural stone. Try to scratch the glass you’ve brought with the rough, broken edge of the stone. Real quartzite makes a big ol’ gouge in glass. Try scratching the glass with a few different places on the stone. If it’s not consistently gouging the glass, it’s a red flag that the stone is not quartzite. It might be marble mixed with quartzite. There’s a second test. Find a natural [unsealed] piece of the polished stone and put lemon juice or vinegar on it. Let the liquid stand on the stone for 15 minutes. The lemon juice or vinegar will dull a polished surface if it’s not quartzite. DNJ: Can real quartzite be damaged by cutting directly on it with a knife? KIRK: It will damage your knife. I would never cut on natural stone. I recommend using a cutting board. DNJ: Can heat damage quartzite? KIRK: Generally, it’s heat-resistant, similar to granite. But why risk it? You’ve spent all this money on this beautiful stone, so use a trivet or potholder. KIRK: Some quartzites are stain-proof and others aren’t. Quartzite has a whole spectrum of stain resistance. Taj Mahal quartzite, for example, has formed under high heat and pressure in the earth and is highly stain-resistant. White Macaubas [also spelled Macaubus], which looks a lot like marble, is not as compressed and needs sealing. Nature doesn’t create stone with perfect consistency. Consumers can test a sample with ketchup or red wine at home. DNJ: If my quartzite needs sealing, how often should I do it? KIRK: It depends on how much you use your countertop. You can easily check whether you need sealer. Put water on the countertop where you use it the most, probably the food-prep area near the sink. Let the water sit for 15 minutes. If you see a shadow in the stone [where the water was], it needs sealing. DNJ: Man-made quartz countertops require no sealing, so why would I choose quartzite? KIRK: The authenticity and natural beauty of real stone. People often like the story of the stone, where it’s from or how the variations in the stone form. Quartz is pure practicality. It will always match and needs no sealing. DNJ: Marble is porous, so it will readily stain and etch, but granite is pretty easy to care for. Why would I prefer quartzite over granite? KIRK: These natural stones have very similar properties, and their care is very similar. It’s just a matter of aesthetics—the look you’re going for—and price. DNJ: Does some quartzite resemble marble but need less careful handling? KIRK: Yes. Some types have the Old World look of marble without the upkeep. White Macaubas is one of these, as noted before. It can be cut different ways for two different looks. It can be cut linear for a contemporary look showing the layers of sand. Or it can be cut diagonally to look more like marble, with soft gray swirly bands. [When cut this direction,] it’s very hard to look at and not think it’s marble. DNJ: What cleaners should be used on quartzite countertops? KIRK: Soap and water is 99 percent of what you need. If cleaning the counter after working with raw meat, you could use a disinfecting cleaner or bleach in low concentration [mixed with water]. DNJ: What colors are available? KIRK: The basic is white and gray or warm gray or cool gray. But there are other colors, depending on what minerals are in the quartzite. You can have maroons, golds, greens. Van Gogh quartzite has saturated colors. It’s not for everyone because it’s really wild. In warm colors, you will see tan to brown through burgundy. Blue is possible, but it’s rare. Azul Macaubas is a well-known blue quartzite. DNJ: Some quartzite names are confusing, so let’s set the record straight in the next four questions. First, what is “soft quartzite”? KIRK: Soft quartzite is a myth. The term evolved to explain something called “quartzite” that isn’t really quartzite. It’s mislabeling. 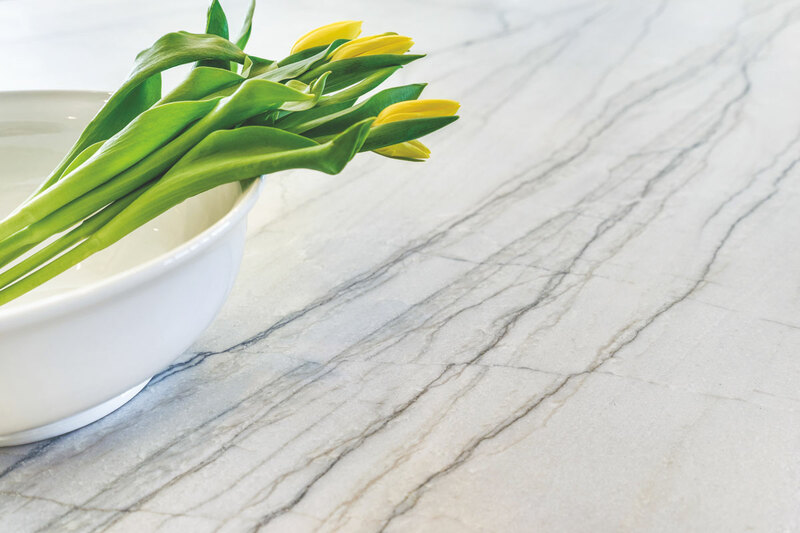 If you see something called soft quartzite, chances are it’s marble. If it’s marble, it’s soft. And if it’s quartzite, it’s hard. DNJ: Is it possible to differentiate Super White from other stones? KIRK: Super White is dolomitic marble, which has just a slight chemistry difference from regular marble. It doesn’t etch right away with the etching test. Some Super White has little blobs of quartz in it but not enough to make it resist etching. DNJ: Websites show photos of Calacatta quartzite and Calacatta marble, and various spellings of Calacatta such as Calcutta. Can you explain the labeling? KIRK: There’s also manufactured quartz called Calacatta! [The marketing is] capitalizing on the famous name of the marble, but they are all different. DNJ: Online sources say Fantasy Brown quartzite has layers of marble and layers of quartzite. So what are the best practices on care and cleaning? KIRK: Authentically, it’s categorized as marble like Super White. Sometimes it is straight-up marble and sometimes it has quartzite in it; you can see the layers. When caring for it, think of its lowest common denominator marble and treat it that way. DNJ: Will quartzite last indefinitely? KIRK: Yes. The harder the quartzites are, the older they are—hundreds of millions of years old. They’re not going anywhere. DNJ: Is there a respected online source for learning more? KIRK: I’m not usually a self-promotional person but see my article “The Definitive Guide to Quartzite” [at UseNaturalStone.com]. It clears the air in one place. 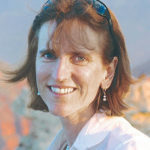 Texas-based freelancer Mary Vinnedge has written about home and design for more than 20 years.